Dewsbury Moor's Jordan Foster runs at the Skirlaugh defence during Saturday's Challenge Cup victory. Thornhill Trojans will entertain Rochdale Mayfield in the Coral Challenge Cup second round, while Dewsbury Moor face a trip to East Leeds, with the ties to be played over the weekend of February 9 and 10. 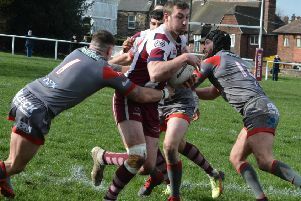 Both Dewsbury clubs had outstanding first round results last Saturday with Thornhill inflicting a surprise defeat on National Conference Premier Division champions Hunslet Parkside, while Moor overcame strong Humberside outfit Skirlaugh. Mayfield booked their second round place with a 14-4 win away to Kells, while East Leeds defeated Conference newcomers Batley Boys. The second round draw was made by Wigan Warriors and England half-back George Williams and Leigh Centurions captain Micky Higham at the home of Wigan St Patricks on Monday evening. Higham’s former amateur club Wigan St Patricks were given a home tie against the Great Britain Police. St Patricks had won at Leigh East in the first round, while the Police beat Wallsend Eagles in the North East. The Royal Air Force earned a first-round win at North Herts Crusaders and will make a long trip to Cumbria from their Lincolnshire base to face Distington. Other intriguing clashes among the 13 second-round ties see Thatto Heath of St Helens hosting Leigh Miners Rangers, while Moor’s trip to East Leeds is one of three West Yorkshire derbies with Ovenden playing West Bowling and Milford facing Lock Lane. Millom, who beat Red Star Belgrade in the first-round, face Halifax side Siddal, the former club of current Dewsbury Rams coach Lee Greenwood. Coral Challenge Cup Round Two draw: Underbank Rangers v Featherstone Lions, Wigan St Patricks v Great Britain Police, Thornhill Trojans v Rochdale Mayfield, Thatto Heath Crusaders v Leigh Miners Rangers, Ovenden v West Bowling, Normanton Knights v Haydock, West Hull v Bentley, Milford Marlins v Lock Lane, Wath Brow Hornets v York Acorn, Drighlington v Wigan St Judes, Millom v Siddal, Distington v Royal Air Force, East Leeds v Dewsbury Moor.